Change your evil eye into 3D! 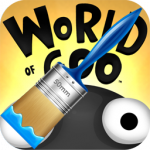 Images from Android version of World of Goo. Special thanks to Kyle & Ron. 0.4 changelog: Removed shine and unchanged resources. My first chapter. This chapter is the prequel of the Moon chapter so it is Chapter -1! Some of the levels require you to think. If you don't know how to beat the level or get OCD, just think about it. This level will overwrite Chapter 3, so if you want to play the original levels in Chapter 3, you can try this awesome goomod called World Spin. World of Goo Modifier (aka WoGModifier) is a utility that helps you goomod more easier and faster. You need to install .NET Framework 4.5.1 (or this link) before using this program, just like you must install JRE before using GooTool. Although it's a preview version but it has all functions it ever had! And more functions! Welcome to try and give me some suggestions! And please rate after trying. Weird gravity makes goo balls fly like sine wave, oval or infinity which can make a lot of fun! Well, the level itself isn't difficult but it's fun, enjoy it. Please rate this after downloading. Thanks. Moved this level to Chapter 4. My sixth level and also my third level in the midnight. This level is my first try to use the slider (twice). Watch out the broken boat! P.S. Goo balls cannot dive too deep.